Cornel Zimmer represents the fourth generation of organbuilding in his family. He began working with his father at an early age helping to tune and service organs on school holidays and summers. He attended the University of North Carolina at Charlotte for two years as an Accounting Major before returning to work as a full time organbuilder at the family firm of W. Zimmer & Sons, Inc. in June of 1981. Cornel was active with the American Institute of Organbuilders throughout his career and attended most annual conventions, workshops, seminars, etc. He has been a member of AIO since 1984. In 1984, he spent time as an apprentice voicer at Carl Gieseke & Sohn in Gottingen (West) Germany. While in Europe for an extended period of time, Cornel had the opportunity to visit and study historic instruments throughout Germany and Holland. He also visited several organ builders and their factories/shops in Germany, Holland and Belgium. Upon his return to the states, Cornel spent the majority of his time at W. Zimmer & Sons in the tonal department participating in the shop voicing of pipes as well as on site tonal regulation of new instruements. Much to his chagrin, Cornel was also charged with maintaining the books and keeping all the accounting records for the firm. In 1987, Cornel was responsible for the research and purchasing of computers for the company. He learned to excel in many programs ranging from word processing, to spreadsheets, accounting and drawing programs. In 1990 – 1991 Cornel Zimmer served as the Vice President of the Associated Pipe Organ Builders of America as the representative for W. Zimmer & Sons, Inc.
Cornel spent many years tuning, servicing and maintaining hundreds of pipe organs of all makes and styles in the American Southeast. This was especially important in his formative years as an organ builder. Not only did he learn many good and interesting ways of building pipe organs, he also suffered with the mistakes of others in tonal layouts, poorly executed mechanical systems, sloppy workmanship and limited access. In June 1992 he left the family firm of W. Zimmer & Sons, Inc. to pursue his own ideas and philosophy of pipe organ building. With the blessing of his father, Franz J. Zimmer, he started his own company, C.A. Zimmer, Inc. (dba Cornel Zimmer Organbuilders) and began the process of formulating his own ideas of tonality and construction techniques which also included digital technology both in console control as well as tone generation. In 1995, CZOB built their current building and purchased the pipe shop from W. Zimmer & Sons. Since then, Cornel Zimmer has surrounded himself with the best and brightest talent that the organ industry has to offer. Together, they have built nearly 150 instruments, bringing the highest standards of pipe organ building to the world of digital and combination instruments in addition to their lifetime passion for the pipe organ. Chip joined our firm officially in June of 2016, but has been working with us on various projects since 2014. Chip is a brilliant organ technician who brings many skills of organ building to our firm, specifically in the area of console and chest wiring. A native of upstate South Carolina, Chip Mays serves as music director and organist at Seneca Presbyterian Church in Seneca, SC. He holds a BS in biology from Furman University, Greenville, SC; a BA in music from Anderson College, Anderson, SC; and a Master of Church Music from Erskine Theological Seminary, Due West, SC. 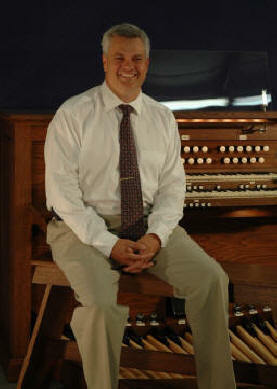 From 1999-2002 Chip worked with John Santoianni of Advent Pipe Organ Services in Greenville, SC. He learned much about the basics of organ repair and maintenance from John. When John relocated to Durham, NC in 2002, Chip and Steven Moore began Foothills Pipe Organ, LLC, an organ tuning and maintenance firm based in Greenville, SC. In addition to music, Chip enjoys architecture, antiques, good beer, and the continuing renovation of his 1919 bungalow in Greenville’s East Park Historic District neighborhood. He has a beautiful 9-year-old daughter, Mary Banton, who is in third grade at Stone Academy in Greenville, SC. Anthony Nichols joined Cornel Zimmer Organbuilders in January 2015 as a voicer and tonal finisher. He holds a Bachelors degree in voice and choral conducting with a minor in organ from Mars Hill Hill University. 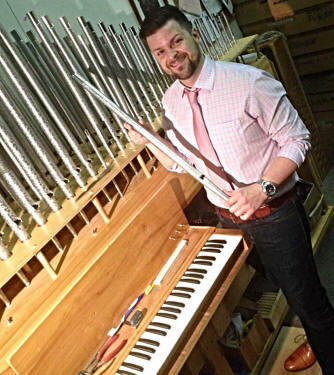 He brings with him a wealth of experience creating and realizing tonal designs through the application of his in-depth knowledge of pipework construction and materials, gained across 17 years in the pipe organ industry. Anthony comes to us via the staff of the world-famous Wanamaker Organ in Philadelphia, where his involvement with the tonal finishing of the relocated Orchestral and Chorus Divisions helped to bring its distinguished color palette to life. His ability to plan and oversee the colossal instrument’s tuning was recognized as exemplary by the Grand Court Organist and resulted in his being named Chief Tuner. In addition, Mr. Nichols has taken part in the restoration and care of a number of E. M. Skinner organs in both sacred and residential settings. His studies of historic instruments have borne fruit through his talent in restoring proper speech to vintage pipework and his application of details of the materials and construction of accomplished organ builders of the past to new and expanded instruments. 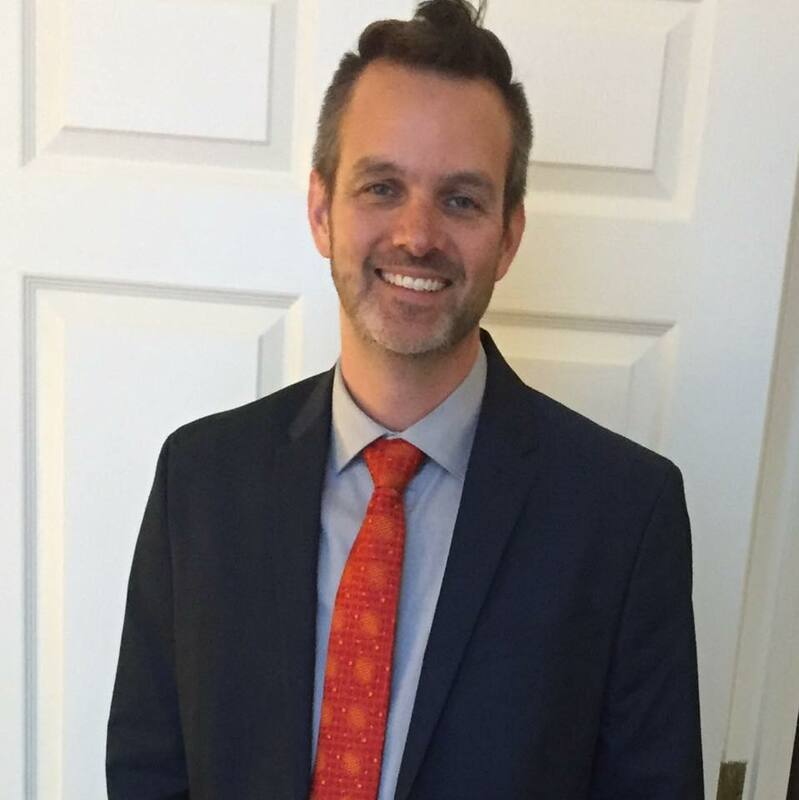 Aaron joined Cornel Zimmer Organbuilders in the summer of 2006 after graduating from Lenoir-Rhyne University with a Bachelor’s Degree in Music Education along with a North Carolina Educator’s License in Music Education (K-12). 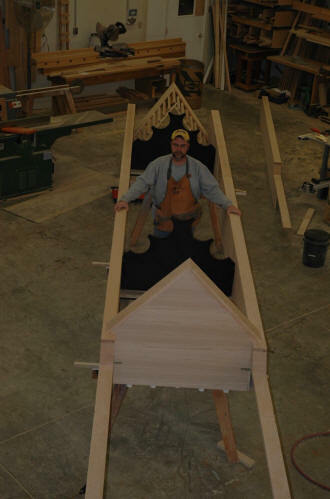 Aaron began working at CZOB as apprentice to our Master Cabinetmaker. After a year in the organ building industry, he decided to accept a band director position at Bunker Hill High School in Claremont, NC. While there, Aaron grew the music program adding a handbell ensemble and jazz band to the Symphonic and Marching band curriculum. During his four years as a teacher, Bunker Hill received many accolades and Superior ratings at State Adjudicated functions and Marching Band competitions. Aaron continued working part-time at CZOB while he was teaching, spending his free time and summer break helping out around the organ shop. Aaron decided to come back to CZOB full time in the Spring of 2011. Aaron’s primary function is general shop manager with an emphasis in the woodworking division. He has always loved woodworking as a hobby, building furniture for his friends and family, and he has an innate ability in the critical applications of woodworking in building consoles, casework and windchests. Aaron is responsible for CZOB’s purchase of a CNC router. He learned and excels at programming this vital piece of equipment that marries the art of woodworking to the critical efficiency needed to compete in a competitive atmosphere. As a result of his passion for the work and his demonstration of skill, knowledge and work ethic, Aaron became a substantial shareholder of Cornel Zimmer Organbuilders in 2012 and is currently serving as Vice President of the firm. Aaron lives in Lincolnton, NC with his wife Anna, and beautiful daughter Sophie. Jim Twyne graduated from East Carolina University with a degree in church music. In 1972, he moved to Charlotte, NC and started to work with the Zimmer family where he gained a wealth of knowledge in chest assembly, wiring, pipe fitting, and other organ assembly procedures. He also spent 20 long years on the road doing seasonal maintenance and tuning. In 1975, he moved mainly into the tonal department of the business where he was put in charge of voicing of pipes and tonal finishing on site. In 1995, he joined Cornel Zimmer Organbuiders as the tonal director. Since his joining the company, Jim has been a key player in managing the complicated process of organ building. 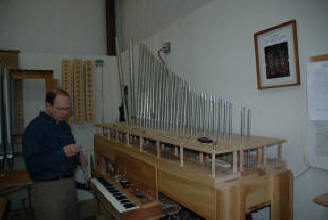 Jim is knowledgeable about all aspects of organ building and his guidance and advice is appreciated by all at the shop. He is responsible for shop voicing all new and vintage pipework and onsite tonal finishing of pipe and digital voices. Working together with Cornel, Anthony and clients, Jim designs and draws up tonal specifications for new organs. He then creates scaling information for new pipes as well as choosing and assigning digital voices for organs that make use of the latest technology from Walker Technical Co.
Jim’s knowledge and experience as an organist gives him the insight to assist in console layout and design. Being of average size and build, Jim also serves as our “average organist” model whenever a question of ergonomics comes up. 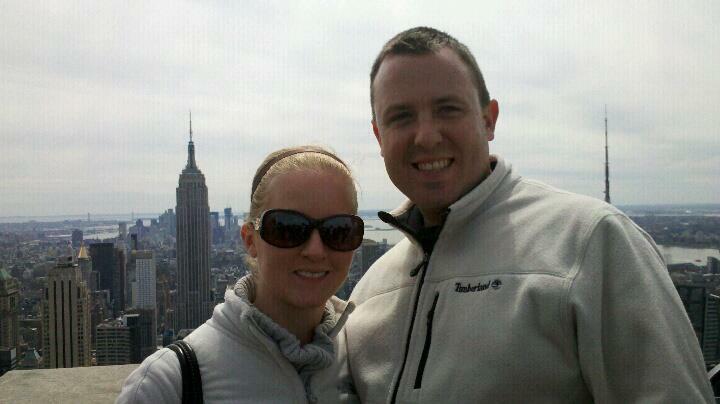 Jim and his wife, Melanie, are active in the music program of their church, First Presbyterian Church of Charlotte. Their contributions to the church include singing in the choir, ringing handbells, and accompanying the children’s choir. When not traveling, Jim will sometimes play as substitute organist. George was recruited to Cornel Zimmer Organbuilders in January 2000 at the recommendation of his woodworking peers and because of his reputation for perfectionism and valuable experience. George apprenticed in the United States Air Force, Corp of Engineers from 1982-1987, in the states of Alaska and Montana respectively as a carpenter specialist. Upon re-entering civilian life, George moved his family to Sarasota, Florida where he continued to train and progress in his career, building cabinetry and fine furniture. He was employed first by Ray Routh cabinetry, and second by Walter’s Woodworking, a specialty furniture and cabinet shop. It was in this gulf coast environment that George’s artistic ability was encouraged, challenged and confirmed. He was commissioned to do an exciting array of projects of various size and complexity. His responsibilities steadily increased which eventually led to a promotion as supervisor of all woodshop production, from initial design to the engineering of all wooden components. George excels in the ability to do research and development on new ideas and also the ingenuity required for the rebuilding of old ones. George participates in the design and engineering of all components built in his shop. His vast knowledge and experience in joinery are invaluable in the design of consoles, windchests, casework, structure, etc. George’s finest attribute is that of teacher. He is not the least bit stingy with his abilities. More often than not, you might find George in the woodshop disseminating his skills to others. He has been a mentor to the younger builders and he always makes himself available for advice and thoughts. George’s contentment and positive attitude is a tribute to the woodshop. His commitment to quality and efficiency will definitely contribute to our future success. Under his supervision the woodshop runs with like clockwork. From his bench have come the qualities of good judgment, knowledge and a fine tuned sense of humor. His candor is appreciated and serves as an invaluable example to all of us. George is a highly respected and appreciated employee of Cornel Zimmer Organ Builders where the gift of quality workmanship flourishes and is refined to honor and glorify God in each production.